The eternal power which the Brahman represents, the source of knowledge, that illuminates the whole universe is manifested as Arunachala and shines brilliantly at Tiruvannamalai. The name Arunachala spells truth, knowledge and bliss. While Kailash is considered as the seat of Lord Siva, Tiruvannamalai Mountain is considered as Siva Himself. It is believed that liberation (Mukti) is attained by mere thought of Arunachala. Lord Arunachala appears in Tiruvannamalai in form and without form and his beginning or end was inaccessible even for Brahma and Vishnu and therefore the Lord has come to be known as ‘the inaccessible Lord of the mountain’ (The word ‘Anna Malai’ meaning inaccessible). But Lord Arunachala is easily accessible to all his devotees. He even used to beckon the devotees towards Him. Among the kings, saints and devotees he attracted towards him, there was the young Venkataraman at Tiruchuzhi who heard the call, came to Tiruvannamalai, experienced the grace of Arunachala and became known as Bhagavan Sri Ramana Maharshi. Kanchi, the city with a great cultural heritage, is very sacred and described as Mokshapuri, the city that confers liberation. It is one of the seven sacred cities of Bharata Varsha. Among the other sacred cities; Ayodhya, Mathura, Dwaraka, Haridwar, Kasi and Ujjain, the first three are sacred to Vishnu and the other three are sacred to Siva. Kanchipuram is unique because it is sacred to both Siva and Vishnu. Many temples of Lord Siva and Lord Vishnu are located here. References to Kanchi are found in Siva Rahasya, Markandeya Samhita and in many other scriptures. Kanchi has become the centre of cultural and religious activities. It remained as the venue for philosophical and spiritual deliberations and continues to be so. Adi Sankara has therefore chosen this city as the ideal place to proclaim the message of Advaita Vedanta and establish the pontificate known as Kamakoti Pitha. The word ‘Kama’ means desire and ‘koti’ means the end. In other words, Kamakoti Pitha refers to a state where all worldly desires end and the brilliant rays of knowledge dawn. Kamakoti Math is more than a mere Institution or Math. It is a beacon light that radiates the light of knowledge and devotion throughout the land. People look up to Kanchi Math at every stage of their life, in good or bad times, for a blessing, an advice, a help or for a Satsang and Kanchi Math always served as a friend, guide and philosopher. It is a source of inspiration for many. 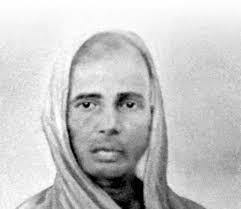 Among the illustrious line of successors who graced the Kanchi Peetham and carried the message of Sri Sankaracharya, Sri Chandrasekharendra Saraswati Swamigal needs special mention. According to Bhagavan Sri Ramana Maharshi, the Brahma Jnani, the highest end a human should aspire for is liberation (Mukti), which is possible only by means of Self Realization”. The ultimate knowledge is the knowledge of the Self, Atma Jnana. He advised the path of Atma Vichara (self enquiry) by which one can elevate himself from the illusion of the world, from the realm of body and mind and regain his natural state of Realization. Kanchi Acharya followed a slightly different path. He advocated Sanatana Dharma, the eternal principles of truth and righteousness. The Jagadguru dedicated his life to establish an order that is in harmony with our Vedic culture, where truth, peace and happiness prevailed, where qualities like devotion, humility, compassion and purity formed the backbone of the society. 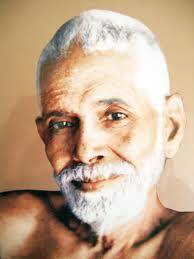 While Sri Ramana Maharshi set Self-Realization as the ultimate aim, Kanchi Acharya underlined the need to uphold Dharma. While Sri Ramna Maharshi highlighted the importance of Atma Jnana through Self-enquiry, Kanchi Acharya followed the path of devotion, discipline and Upasana. While Bhagavan confined himself at Tiruvannamalai ever since his arrival there, Kanchi Acharya embarked on a long pilgrimage to different parts of the country carrying the message of Sanatana Dharma. While meditation, introspection and Self-enquiry formed the main practice at Sri Ramanasramam, Pujas, rituals, recitals of hymns formed the practice at Kanchi Math. It would appear that the Maharshi at Tiruvannamalai symbolized Jnana and Maha Swamigal at Kanchi symbolized devotion, but the difference is only peripheral and not substantial. In fact, Jnana and devotion are two sides of the same coin. Bhagavan Ramana Maharshi, the Atma Jnani, has underlined the importance of surrender which, in other words, is the highest state of devotion. In his ‘Aksharamana Malai’, he has expressed his devotion towards Lord Arunachala in beautiful verses. He said that Bhakti is the mother of Jnana. As Bhakti attains its supreme state, the Para Bhakti, it leads to Jnana. Similarly, Kanchi Acharya, a strong advocate of Sanatana Dharma also underlined the importance of Adma Vidya. According to him, Sanatana Dharma has two-fold meaning. The first and foremost is Swadharma, the duties to be followed towards one’s own Self or in other words, to realize one’s own Self and the duties to be followed in dealing with the world. In his immortal works “Deivathin Kural”, Paramacharya said: “Though we differentiate Jeevatma and Paramatma, there is only one reality, Brahman, which shines as Atma in everyone but the difference and duality come due to the operation of mind and Maya. It is only by adhering to the principles of Dharma, following the path of devotion, discipline, dispassion and through surrender we can attain the spirit of one-ness (Advaita),” he said. The question continued to be asked as to why these two giant sages never met each other, despite being in short distance. The answer to this question came from Jagadguru Himself. It was sometime in October 1947. The sage of Kanchi was camping at Tiruvannamalai. Then, a devotee went up to the Acharya and posed this question. Prompt came the reply from Paramacharya: “When were we separate? Only if we were apart from each other, the question of meeting comes; but we were always one”. In one sentence, Paramcharya has made it clear that the two sages never saw each other as separate entity and they considered as one, without a second, in the true spirit of Advaita. Dr T.M.P. Mahadevan, Professor of Philosophy, an erudite scholar and disciple of Sri Ramana Maharshi said about the sage of Kanchi: “He was divine and yet human, whose saving grace was universal in its sweep and whose concern was for all; for the lowliest and the last. He was embodiment of compassion. He was humbleness personified. For sixty-three years, Sri Chandrasekharendra Saraswathi has been fulfilling the noble spiritual mission entrusted by Adi Sankara to his successors bearing his holy name. Numerous are the ways in which he gave the lead for human upliftment.” Devotees considered him as the ‘God ever on the move’ (Nadamadum Deivam). Among the innumerable devotees who venerate both Bhagavan and Paramacharya equally, special mention should be made about Sri Ra Ganapati, who played a major role in the creation of “Deivathin Kural’ (the Voice of God). Just as Munagala Venkataramiah did his service in the composition of the works, “Talks with Sri Ramana Maharshi”, Sri Ra Ganapati did immense service in the composition of the immortal works, “Deivathin Kural”. Ra Ganapati came in contact with Bhagavan Ramana even from his younger days. It then became a divine relationship that flourished for many years. He wrote many articles about Bhagavan in the journal, “Mountain Path’, brought out by Sri Ramanasramam. “Going through ‘Sri Ramana Nool Tirattu’ one would find Maharshi not only as a Rishi (seer) but also as a Kavi (poet). If one goes into merits of these poems both in style and meaning, he would find him a Mahakavi. The poems are diamonds, cut in the finest literary style and shedding the loftiest spiritual ideals,” Thus wrote Ganapati in his article about Sri Ramana Maharshi, who held equal devotion towards Kanchi Acharya also. Among the many articles Ra Ganapati wrote, the one published in the souvenir of Kanchi Kamakoti Peetam deserves special mention because it portrays vividly and truthfully the relationship between Sri Ramana Maharshi and Sri Chandrasekharendra Saraswati Swamigal. According to Ganapati, in one of the discourses held at Madras, the sage of Kanchi has highlighted the qualities or the absence of qualities (nirguna) of Bhagavan. “He was a perfect impersonality and a Jivan Mukta, liberated even while living in a body”, Acharya had said about Sri Ramana Maharshi. Undoubtedly, there prevailed perfect peace, harmony and divinity in their relationship. However, there came an occasion when some eye-brows were raised. Bhagavan’s mother Azhakammal attained Mukti (liberation) in the month of May 1922. After performing rites and rituals, the mortal remains of the mother were buried near Palitheertham which necessitated shifting of the Ashram near the burial place. A temple was also constructed over the mother’s Samadhi as Azhagammal lived the life of a saint. The consecration of the temple, Matrubhuteswara, was performed later in the presence of great saints like Sankaracharya of Puri, Swami Shantananda and many other devotees. Adjoining Matrubhuteswara temple, a large hall was constructed which came to be known as Sri Ramanasramam. But, questions were raised whether a temple could be consecrated over the Samadhi of a woman, who was not initiated to the order of sainthood in the prescribed manner. The opinion was divided among the pundits. Kanchi Math, established by Adi Sankara, has been occupied by 67 revered Acharyas from ancient time and is adhering to certain principles, practices and values. Therefore, Kanchi Math could not recognize the temple constructed over mother’s Samadhi, as a shrine of sanctity and divinity. Even Paramacharya was obliged to issue a directive to this effect. Bhagavan Sri Ramana Maharshi, who always abided by the Self, beyond the realm of body and mind, heard about it and remained quiet and unmoved. It made no impact on him. However, he agreed that the Math has to observe the traditions which are carried forward for years and also need to demonstrate its commitment to these traditional values. Subsequently, Paramacharya visited Tiruvannamalai on two occasions; one in 1929 and another in 1944. On both the occasions, he made the customary Giri Pradakshinam (circumambulation of Arunachala Mountain). It was known in advance that Paramacharya would pass by the Ashram since the Ashram lies on the Pradakshinam route. Having known about Paramacharya’s views about the sanctity of the Ashram, his entry into the Ashram premises was out of question. However, Bhagavan told his disciples that they may gather at the gate of the Ashram and pay obeisance to Paramacharya, if they wish. As for Bhagavan, he remained ever in conscious of his Self and did not see any reason either to invite anyone or see any one. However, with the green signal provided by Bhagavan, the disciples and devotees present at the Ashram came out, waited in front of the gate. They paid their respects and reverence to Paramacharya while the sage and his entourage were passing through the road. The disciples, including the ardent one like Kunju Swamy, observed that when Paramacharya reached the particular spot, he stood for a while, turned his eyes towards the entrance of the Ashram, stopped for few seconds, looked around and continued to walk along the Pradakshina route. It is learnt that during the public discourse which he held later, he had said: “It is difficult to attain a state that transcend the four stages of life (Brahmacharya, Grihastha, Vanaprastha and Sanyasa), without actually passing through them and to go beyond the three states of deep sleep (sushupti), dream (swapna) and waking (jagrata) and this has been possible for the great soul like Ramana Maharshi”. Ra Ganapati considered both Bhagavan and Maha Periyava as two different manifestation of one God. 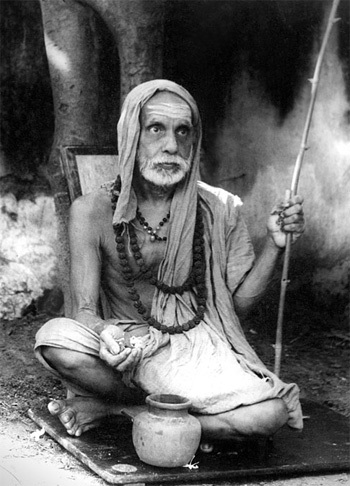 He continued visiting both Maharshi and Maha Periyava. Later, Ra Ganapati visited Kamchi Acharya and made a subtle reference about Acharya’s earlier view in regard to the questionable sanctity at the mother’s shrine at Ramanasramam. Then Acharya made it very clear that his view held relevance only at that particular time and not now. Swamigal said that ever since Kumbhabhishekam was conducted in 1949 by strictly adhering to the Agama Sastras, the temple has attained the sanctity and sacredness and he advised that this temple should form part of the pilgrimage undertaken by all devotees. We have seen the common factors that united these two giants as one. For the same reason, we find that devotees also consider these two sages as Gurus common to them. If one is a devotee of Bhagavan, he is equally devoted to Paramacharya as well. A Puja room is never complete without the picture of Bhagavan and Paramacharya, side by side. They consider Bhagavan and Paramacharya not as two different entities but as one Guru, just as they consider Lord Siva and Lord Vishnu as two manifestations of one Reality. Among the many devotees who held both of them in high veneration was Kanakamma. Kanakamma belonged to a family who were traditionally attached to Kanchi Math and the successive Acharyas. She was brought up in the same culture of inalienable devotion towards Kanchi Math. Her parents believed that devotion gets stronger when it is exclusive and one-pointed and gets diluted when diversified. So, they felt a little disturbed when they observed that their daughter Kanakamma was equally devoted towards Sri Ramana Maharshi and Sri Chandrasekharendra Saraswati Swamigal. When Kamalamma expressed her desire to go to Tiruvannamalai, the mother was reluctant to agree. Since she could not say ‘no’ to her daughter, she decided to seek the help of Paramacharya, the ocean of compassion who was easily approachable. Having heard the mother’s predicament, Paramacharya called Kanakamma and asked her few questions. The mother who was watching it from a distance thought that Acharya was trying to convince her daughter and asking her to refrain from going to Tiruvannamalai, but when she went nearby, she was surprised to hear Acharya saying: “Go to Tiruvannamalai and meet Sri Ramana Maharshi. It makes no difference whether you go ‘there; or ‘here’ (ange aanal enna, inge aanal enna?)”. Thereby, Paramacharya has given the message, loud and clear, that the power that reigns at Tiruvannamalai and Kancheepuram is the same. The mother was spell-bound by this remark and thanked Paramacharya for dispelling her wrong notion. Though there are different paths like path of knowledge (Jnana Marga), path of devotion (Bhakti Marga), Path of duty (Karma Marga), path of meditation (Yoga Marga), ultimately all the paths lead to one single goal, the Lotus Feet of Kesava who shines as the Self within. Since the devotees are in different levels are understanding, our scriptures have advised different paths that suit the aspirants. Just as the rain water that falls from the sky above, flow through different paths and ultimately merge with the ocean, the different paths the sages advise ultimately converge at the same end; at the feet of Kesava. (Aakashath Pathitham Thoyam, Yatha Gachathi Sagaram, Sarvadeva Namaskaram Keshavam Prathi Gachathi). Seldom humanity witnessed Brahma Jnanis (knower of Brahman) who remained in Atma Nishta (absorbed in Self) as Bhagavan Sri Ramana Maharshi and Sri Chandrasekharendra Saraswati Swamigal. Seldom, the world has seen sages to whom the existence or extinction of the body made no difference. Rarely there were saints who by simple means brought about a spiritual awakening. They appeared as Gurus, dispelled the darkness and elevated the devotees from the world of illusion to a new world of knowledge. They kindled the light of devotion, awakened the people and led them to spiritual fulfilment. Though attained Videha Mukti, they continue to guide the devotees to the path of truth, the path of peace and path of love.